AMOEBA is a general-purpose computational fluid dynamics (CFD) analysis software that enables you to examine geometries, inspect meshes, model complex flow and heat transfer problems, create visualizations, and view reports. The AMOEBA solver solves Navier-Stokes equations and allows modeling of complex flow and heat transfer problems in arbitrary geometries. AMOEBA can solve a number of problems in computational fluid dynamics, including, but not limited to, laminar and turbulent flow with convective and radiative heat transfer, time-dependant simulation, porous media, natural convection, multiple reference frame, and sliding meshes. 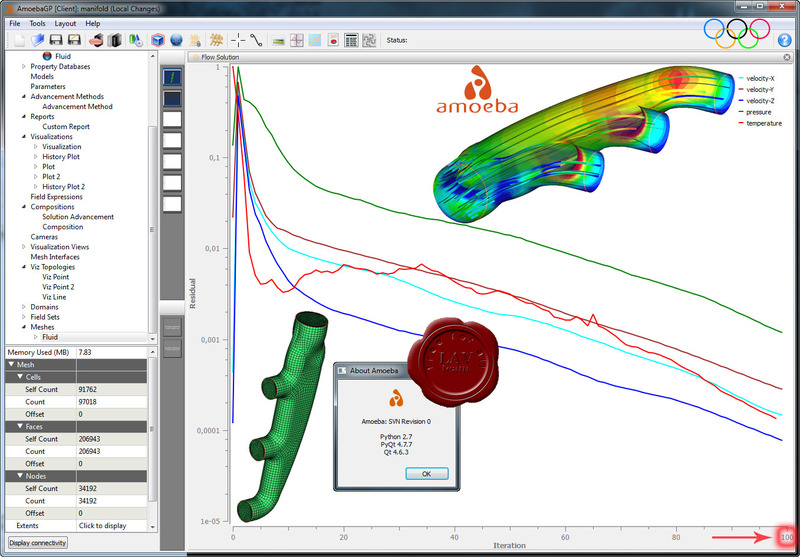 Along with the ability to solve large and diverse fluid flow problems, AMOEBA makes it possible for you to move beyond single-point simulation by enabling you to get a solution and its sensitivity to any parameter - input or operating conditions or material properties - in a single solution without having to simulate over a parametric range (sensitivity analysis). Sensitivity analysis is the study of how the variation (uncertainty) in the output of a mathematical model can be apportioned, qualitatively or quantitatively. The AMOEBA client is a free version of the software package that incorporates the ability of setting up and solving a CFD analysis problem. The free version, available for download on the website, allows you to run up to five iterations for a problem.